I could’ve spent another night in Tokyo, but knew I had to save money and energy for the remained month, so after we woke up and cleaned off in the capsule hotel, I knew that to Carmelo’s chagrin I’d be going home. But with the shinkansen running until nine o’clock, I didn’t see any rush. We started that day with a conbini breakfast and walking a complex route to the Tokyo Metropolitan Government Building in Shinjuku to go to their observation deck. At 243 meters tall they’re a whopping 391 meters shorter than Tokyo Sky try, but they get the job done and best of all it’s free. You can actually see Sky Tree off in the distance there, so some might consider this view even better. 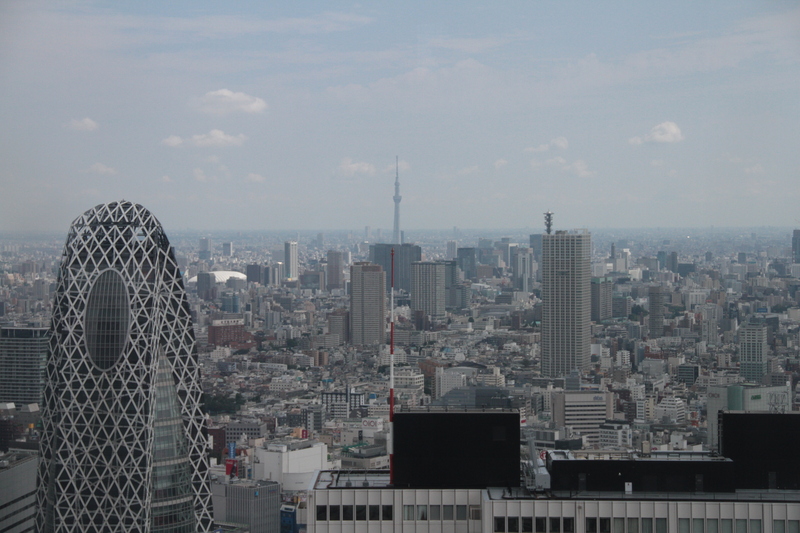 For me the view of Tokyo, especially during the day, is not considerably beautiful. It’s hardly even inspiring or enjoyable. Mostly I like to see it to be reminded of the extent of humankind’s dominance and destruction, and the fact that my presence in the history of the earth is (yet) hardly impact. For anyone who’s seen the top of (the skyscraper formely known as) the Sears Tower or the Empire State Building there’s a certain clarity there that Tokyo doesn’t offer. With American skyscrapers you can look down the grids of highways and streets to realize that even at large scales there is still some order in the world. When looking at Tokyo, for once, Japan is a sprawling chaos. We basically spent the entire day in Akihabara venturing further than I had ever been before. If Harajuku is for twenty something girls, Akiba is for twenty something guys. They have so many otaku artifacts, often perverted, for the most obscure of animes and video games. They have objects like keychains, mugs, towels, mousepads, flags, pens, fans, pillows, lunchboxes, folders, hats, costumes, clocks, chopsticks, much more, and on top of all of that perhaps double in the amount of figurines. It’s maybe the best place in Japan to buy computer electronics. For this I suffered as my college laptop is reaching its sixth year and my fears of it dying reach their limit I’ve been in the market for buying parts to build another computer. Alas, reason won out and I was able to keep my hands off the skylake processors and the discount graphics cards. We ended up going to a curry restaurant for early dinner, something I’d been craving for a while. After that I was on my own and could use up as much of the next four hours as I wanted before deciding to go back. At this point I really was getting sick of the city, or at least had a longing to be back in the mountainside of Fukui. But I did roam around a little bit longer, hoping to score on the location of being in Tokyo. I wound up at a used English book store, knowing that Dune wouldn’t last me forever and the remaining books I hoped to finish by the end of the year. Of course, though, it was still a holiday and I got to the store ten minutes before it’s early closing time. It ended up being close to Tokyo station where I needed to pick up the Shinkansen home, so it wasn’t much of a detour and I saved some money anyway. Especially since the ticket home was another $120, a price I stubbornly resigned myself to pay. Overall, the weekend was pretty much the first type of holiday travel I’ve done in my post grad adult life so on that I’ll claim it as a success. It was expensive, fueled by my ‘wing it’ attitude, so I can see why people can’t do it all the time even if they can afford it. But it seems like I’ll often have a long weekend or time for travelling in the future, so hopefully it is something that I can start saving up for. My location is pretty ideal in the grand scheme of geography. I’m nearby four major Japanese cities: Tokyo, Osaka, Kyoto, and Nagoya, and a score of well known traditional sightseeing and modern activity resorts. So here’s hoping for no more cut open foots and trips to the hospital and more getting around and trips to castles. Posted in Travel, Vacation.Tagged budget, tokyo, travel, vacation.